What is the most common trait among the World Economic Forum attendees? They are educated, rich, even hard-working, but at the same time, they are consummate hypocrites. We counted at least 8 panels during the five days in the Swiss mountains dedicated to climate change, environmental and energy issues; possibly the most debated topic among them all. One of the first panels in the opening day was indeed devoted to “sustainable transportation”. You’d think that for someone so worried about the issue, the men and women of Davos would try to set a good example regarding pollution. Oh no, they flocked to Switzerland with thousands of heavy carbon-emitting private planes; and that’s just the beginning. We then have Hollywood and other show-biz celebrities lecturing the common man on respect for others, especially women. After the Weinstein, Spacey, Seagal cases, if anything, it’s time to start debating whether we should revoke the status of celebrities to actors. What is a celebrity after all? Someone that society celebrates for their skills. Ancient Romans and Greeks frowned upon actors. The term “hypocrite” indeed comes from ancient Greek, referring to “acting out” or “play-acting”; acting after all is deceiving the spectator into believing something that the actor in reality is not. Today’s Hollywood appears to fit that definition. While new movies seem to be overly eager to foist the empowerment of women, diversity and inclusion, behind the curtains prostitution and sexual abuses are rampant. There’s no reason to elevate hypocrites to the status of moral examples for society to follow. Moving on, from the movie hypocrites, to the ones of politics. The new champions of globalisation, according to the words of their leaders Narendra Modi and Xi Jinping, are India and China. They are so eager about it that India was considering a whopping 70% import tariff on solar panels from China and Malaysia.1)Trump solar tariffs reverberate in India, China’s biggest buyer, economictimes.indiatimes.com 2018-01-24.China on the other hand loves cultural exchanges so much that it banned hip-hop culture from its media as “tasteless, vulgar and obscene, demeaning towards women and encouraging the use of recreational drugs”.2)China bans hip-hop culture and tattoos from all media sources, The Independent 2018-01-24.For the developing world, openness is subordinated to the national interest. They are more than willing to trade, welcome technological advances, as long as they believe it’s beneficial to the country. A logic that their Western counterparts have completely forgotten, or snub as archaic, bigoted and outdated. Economic panels are particularly insufferable. Is there anything more hypocritical than CEOs of companies evading taxes, dumping wages, taking advantage of lax enforcement of human rights and lobbying with governments for policies with similar impacts then discussing the fact that their business practices are causing booming inequality, resentment towards globalisation and populism? Nobody is forcing them to do that, they do it by their own will. There was never, at any point, someone pointing fingers: “How about us, the men and women that rallied at Davos, stopping doing all of this?”. The “solutions” proposed are the usual of the past: we need to invest in education and compensate the losers. It is the same narrative of many left-leaning parties that chose to adhere to neoliberal dogmas in the 90s. They failed to deliver and there’s no reason to believe it will be any different. What’s more hypocritical than tax dodgers lecturing on inequality? Diversity advocates whining that “single identity politics is dividing society and leading to violence” as noted by Peter Maurer of the International Committee of the Red Cross. Multiple panels insisted on the necessity of “building bridges” among societies and prevent people from segregating themselves according to ethnicity or creed; or make people have “multiple identities” so that they don’t latch on to one but live their lives as rootless individuals. Many Davos attendees have convinced themselves that globalisation would achieve this transformation and they reject the idea that mankind might have a tribal community instinct. In another panel, the Minister of Culture of Sweden, the half-Gambian Alice Bah Kuhnke complained that “culture was being weaponised by the right wing”, forgetting the fact that she is herself an expression of cultural weaponization by her own party’s agenda of changing Sweden’s identity and culture. A common trend at the 2018 WEF meeting was to use “identity politics” as a synonym of “white nationalism”. The rise of white nationalism is certainly part of identity politics, but it’s the reaction, not the cause. If parties choose to pander to minorities in terms of ethnicity, gender or sexual orientation, promising them “empowerment”, and the latter comes at the expense of the majority, how can you complain when the majority protests? The latter didn’t open the proverbial Pandora’s box of identity politics, you did. One of the guests, Daniel Shapiro rightfully points out the tribal nature of mankind and the self-preservation instinct attached to it: any form of aggression activates a self-defense mechanism, insularization and break-down of dialogue. Let’s elect the king and queen of the hypocrisy ball. Women first: Angela Merkel. She issues a lecture mixed with thinly veiled threat to Donald Trump, in which he stands accused of not learning from history. This comes from the head of state of a country which has been running massive trade surpluses thanks to an artificially undervalued currency for almost two decades. Apparently, only Merkel is allowed to wage a currency war against her Southern European and Transatlantic partners. She goes further: “We’ve known since the Roman Empire, since the Chinese wall, only shutting ourselves off doesn’t help to protect your borders.”3)Angela Merkel at Davos: What did she say? And even though she didn’t mention him, was it all about Trump?, The Independent 2018-01-24.If no other intellectual from the academia has the courage to correct her statement, we will. Let’s fact-check: in 376 AD, the Goths seeking refuge from the barbaric Huns, sought the help of Roman Emperor Valens. Valens, using a reasoning that should ring the bell, thought that the Gothic asylum seekers would prove to be a valuable addition to the shrinking numbers of his armies: they would do the job that Roman citizens did not want to do any longer, the soldier’s job. An estimated 200.000 Goths thus crossed the Danube river, ferried by Roman boats. What happened after is the lesson for Angela Merkel’s ignorance: an economic downturn (famine) resulted in the breakdown of Roman and Gothic relations. Facing the risk of starvation, the Goths rose in arms and assaulted their hosts. Emperor Valens, now realizing his mistake, rushed to confront the Gothic revolt near Adrianople, in 378 AD. Valens forces were smashed, with the emperor himself likely killed in battle (his body was never found). So, how did the Roman Empire survive? Exactly the opposite way Mrs. Merkel suggested: the first thing the Goths did after the battle was to assault the city of Adrianople itself. What kept them at bay were the walls. They then turned their attention to the capital, Constantinople, but once again, the walls protected the city (and they would for another 800 years, until the 4th Crusade). The Goths would continue to ravage the Roman empire until their sack of Rome in 410 AD. Lesson of history: walls work, blindly welcoming refugees beyond your integration capabilities destroys civilizations. Merkel fails at Roman history, but there was worse to come. The king of the ball is the oligarch and political activist George Soros. He whines that “Open societies are in crisis, and various forms of dictatorship and mafia states, exemplified by Putin’s Russia, are on the rise.”4)SOROS: The US ‘is set on a course toward nuclear war’ with North Korea, Business Insider 2018-01-25.This comes from a person whose Open Society Foundation funds a massive network of hundreds of organizations pursuing political causes that include mass migration and stirring up a war against Russia 5)Open Society Initiative for Europe: Our Grantees, Open Society Foundations 2017-04.while never officially running for any election, but bypassing the democratic process via the lobbying activities of the “civil society”; but of course, it’s his opponents that are the “mafia”. He then goes on to warn against the totalitarian threat posed by Google and Facebook that could be used by authoritarian regimes in a way that not even Orwell or Huxley could have imagined in their dystopias.6)Not even Orwell or Huxley could have imagined “totalitarian threats” posed by Facebook and Google, warns Soros, CommonDreams 2018-01-28.Meanwhile, Kremlin Watch, one of the many organizations funded by Soros,7)European Values Think-Thank Report 2015 Annual Report, European Values 2016.is making a proscription list of Western intellectuals (left and right, regardless) that are “guilty” of accepting the invitations of Russian media to talk about their views.8)The Kremlin’s Platform for ‘Useful Idiots’ in the West: An Overview of RT’s Editorial Strategy and Evidence of Impact, Kremlin Watch 2017-09-18.Soros himself takes a page out of Orwell’s book, supporting pseudo Ministries of Truth like the already mentioned Kremlin Watch, but also StopFake,9)Understanding Ukraine, Open Society 2015-02.both of which are trusted sources of the EU’s own Ministry of Truth, Disinfo vs EU, FullFact10)FullFact awarded $500,000 to build automated fact-checking tools, FullFact.org 2017-06-29.and Poynter.11)$1.3 Million in Grants from Omidyar Network, Open Society Foundations Will Expand Poynter’s International Fact-Checking Network, Poynter 2017-06-29.If this wasn’t enough you might as well consider that Soros influence within European institutions has managed to achieve the appointment of Mariya Gabriel, a reliable ally12)Reliable allies in the European Parliament 2014-2019, Kumquat Consult 2013.of the Hungarian-American oligarch, at the lead of the “High Level Expert Group on fake news and online disinformation”,13)Commission appoints members of the High Level Expert Group on fake news and online disinformation, European Commission 2018-01-12.yet another Ministry of Truth as if the others were not enough. They aren’t, because apparently Google and Facebook are not censoring enough opinions divergent from Soros’s own, so he decided to declare war on them too. Let’s finish with the fact that Soros is effectively dodging the taxman by transferring $18 billion to his foundation, something that even the Wall Street Journal calls “the biggest single tax-dodge in US history”14)George Soros’s $18 Billion Tax Shelter, Wall Street Journal 2017-11-23.,and there’s no competition for the crown of the ball. It could be a great time to be a Marxist today: “Workers of the world unite! 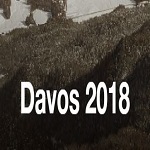 (against the people of Davos)” could easily resonate and rally the masses. So where are the Marxists? Co-opted and neutralized by the Davos elite, with the New Left agenda focused on climate issues and diversity. If they have given up the battle cry, however, it doesn’t mean that someone else won’t use it.